As a regular practice, SAEEA Managing Committee visits its ailing members. They visited Zaheer Beg, badge no. 71771, on September 07, 2015 at his residence. Zaheer Beg is an ex-employee of Industrial Transportation, Saudi Aramco, worked from 1973 to 1993. As a result of a road accident, he got head injuries and was under treatment with three different hospitals. Finally, he was operated in a local hospital. The hospital treated him well and he is now at his home on bed rest. Friends are requested to pray for his fast recovery. 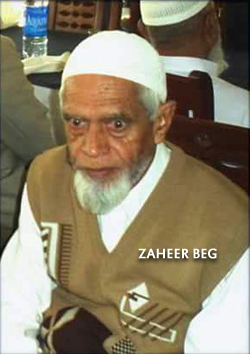 Zaheer Beg, a senior SAEEA member is a living legend, 80+ years of age. Although Zaheer is not very active, because of his old age; however, the age is not an obstacle when it comes to SAEEA activities. He never misses any of SAEEA gatherings. Friends may now visit him at his residence B-142, Block-2, Gulshan-e-Iqbal Karachi or call him at +92-213-496-1723 or his cell no +92-333-236-5470.